Because there is always room for ice cream!! I suddenly have a serious craving for chocolate cake and ice cream. Portable cake just isn't worth eating. Unless maybe it's a brownie. Damn . But portable ice cream comes on a cone..... Yum!! always pie. lemon meringue is the best and most difficult. Brownies are a form of cake. Hmm... Well, restricting myself only to dessert pies and cakes, I would still have to go for pie. Trifle is nice. But the best trifles are the ones with pieces of cake suspended in the jelly, instead of fruit. Cake also has Jaffa Cakes in its corner, and possibly even doughnuts. But you can't beat a good cheesecake. Which is really pie. The very best, and hardest to find, being black cherry cheesecake. MMMMMmmmmmm!!!! I cannot believe this is a thing. Piecaken. I feel sick. I feel inspired! 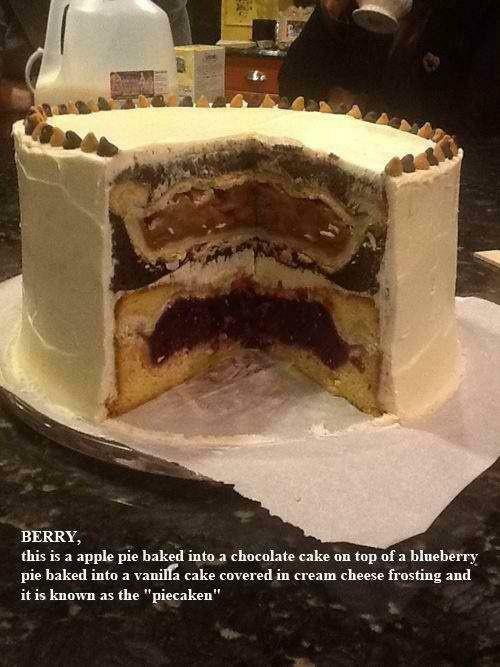 This piecaken sounds awesome!! I need to figure out how to make one. Okay, I found this recipe here: http://piecaken.blogspot.ca/2013_11_01_archive.html. Problem was that I didn't have any of the ingredients on hand and was too lazy to go to the store, so I made do with what I had. The result was an apple pie inside a white cake with cream cheese frosting. Not as visually spectacular as the picture in the above recipe, but this one was real and ready to eat. Verdict: Not sure. I like the pie filling in the cake a lot, but am not sure what the pie crust adds. May have to try making it again. I've never really understood the appeal of pie crust. Thus, I only like pies when the filling is so amazing that it makes up for the pointless crust or when they have something like a graham cracker crust. Or a chocolate cookie crust. Pecan pie with chocolate cookie crust is one of the few pies, in my opinion, that can actually compete favorably with a really good cake. This is the first time I've understood that "Pie vs cake" is a question of two sweet things. I've always assumed *savoury* pie vs cake. Now that's a really tricky question, because a really good pie - steak and kidney, say, or the wonderful duck and orange ones our local butcher used to make - is a thing of wonder. And obviously cake is good. Usually. But sweet pie vs sweet cake? I don't really care. So I've gone for other (chocolate mousse, probably, or maybe even a crêpe beurre sucre, which is the simplest yet most delicious dessert in the universe if done with salty butter). Don't they have Chicken Pot Pie in the US??? They do, and at least on the West Coast, other savory pies seem to be making a comeback, at specialty pie restaurants that serve both desert pies and savory pies. I'm a big fan. That is true, but they don't seem to be very popular, or sold in many places.